This is a lunch box like no other. The Go Green Lunch Box is THE must have item for back to school. The Go Green Lunch Box only costs $34.99. That might seem a little steep for a lunch box, at least it did to me at first. However, when you add up what you spend in one year on lunch boxes and packing materials, it's either the same or less. Then, this is high quality. It will more than likely last more year. 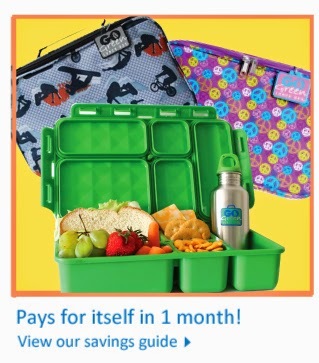 I can't actually state that it does since I haven't actually had it for a school year, but I'd be willing to bet that if you check with me in August 2015 we will be using this exact Go Green Lunch Box again. Plus, if something does go wrong with it, they sell replacement parts right down to the cap for the water bottle. One lucky reader will win a Go Green Lunch Box! Good Luck - winner must be a resident of the Continental U.S.A. and 18+. Disclosure: Reviewz & Newz is not responsible for prize shipment and received no compensation. The Gbabes take their lunch. They usually won't eat the cafeteria food!